​Need business intelligence on sustainability issues? Big data analytics have solutions to guide your strategy. In the late 17th century, Sir Henry Furnese was known for his network of correspondents that delivered information from across Europe. Furnese and his informants are featured in what is probably the first mention of the term business intelligence. As wars shifted the fates of countries and rulers, Furnese’s lock on early information about Europe’s political tribulations helped him become a prominent London banker. Today, business intelligence remains vital. The term refers to the transformation of data into knowledge that can support business decisions. 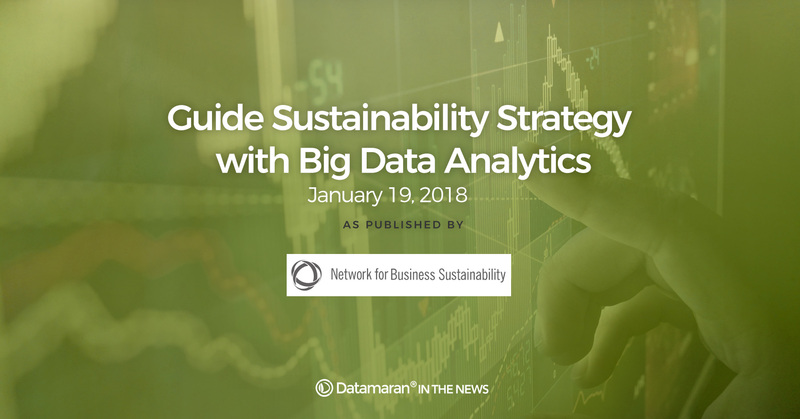 As Environmental, Social, and Governance (ESG) issues become central to business strategy, companies require new types of non-financial business intelligence. Big data analytics offer intriguing solutions that can guide companies’ sustainability strategies. Data on ESG issues come from many sources: news, government regulations, rankings and awards, social media, and companies’ own reports. This information is hard to track – it’s abundant, it changes quickly, and it comes in many formats. Emerging data analytic technologies can address this challenge. Already, services can identify ESG issues that are material to companies, flag risks, benchmark a company’s sustainability reporting against competitors, monitor media references to strategic issues, and analyze sustainability best practices. Data analytic approaches to business intelligence also have pitfalls. Data may be unreliable, or can distract companies from answering questions that are more important but harder to answer. Companies are developing different ways to grapple with such challenges. Companies need to identify the most relevant issues for their sustainability strategy. They often approach this task with a methodical process of materiality assessment. Traditionally, company staff or consultants talk with and survey key stakeholders, such as board members, executives, customers, investors, and NGOs. The company learns what importance stakeholders attach to items on a pre-defined list of ESG issues. Such traditional materiality assessment also builds stakeholder relationships. But it can only be done occasionally, since it’s expensive and time consuming. Resource constraints also mean that the process can only target a limited number of issues and stakeholders. The company needs to identify key stakeholders and issues in advance, and the assessment’s value depends on getting those picks right. Datamaran, a business intelligence platform, takes a different approach to materiality assessment. Without interacting directly with stakeholders, the platform reviews multiple sources that provide proxies for their views. The system analyzes how these sources address ESG issues and produces tailored reports for clients. Compared with the traditional approach, such an analysis is more comprehensive and can be done on an ongoing basis. The company has databases of corporate reports, regulatory initiatives, and online news sources, which it continuously updates and monitors. It also tracks social media conversations. Datamaran’s engine searches these sources for content relevant to 100 different ESG topics, using a dictionary with over 6,000 key terms. The system tracks the amount of space dedicated to each of these topics, as well as the context in which they are mentioned. Datamaran’s materiality assessments cover concerns in each market and industry; issues faced by competitors, supply-chain partners, and stakeholders; changes in the regulatory environment; and sentiment in the news and social media. The resulting analysis is more comprehensive than a traditional one and can also be continually updated. Shortly after Liberty McKee opened her Howell, Michigan hair salon, 85 comments appeared within minutes on the new business’s Facebook page, accusing her of murdering her grandparents for life insurance money. These posts were part of a campaign of false claims that also accused the business of ISIS ties. The posts strained relationships with customers, employees and community members. Stakeholder relationships are at the heart of sustainability strategy, and such relationships can be deeply hurt by false social media posts that sometimes go viral within hours. Attēgo offers a data-analytic solution. The company has developed altumINSIGHT, a tool that monitors social media conversations related to company operations, provides early alerts on emerging risks, and identifies ways to shape social network narratives. altumINSIGHT tracks the content of social media conversations and analyzes the structure of the communications network. The tool identifies stakeholders and monitors their level of trust toward the company. Based on social network analysis, the system identifies each stakeholder’s conversational role and degree of influence within the network, allowing the company to connect to the most influential communicators. RepRisk addresses a related problem: sustainability risks that companies face due to their relationships with other organizations, such as suppliers or collaborators. A company can become associated with questionable ESG practices and be held accountable for them: for example, as when white supremacist protests used Tiki Torches recently. RepRisk’s ESG Risk Platform provides risk monitoring, using a database with risk data about over 100,000 organizations globally. Daily, the platform screens over 80,000 media and stakeholder sources in 15 languages, tracking whether companies might be linked to issues such as local pollution, human rights abuses, or child labor. Clients can use RepRisk reports for due diligence on new business partners or to monitor existing partners. So much information is available — but how trustworthy is it? With the digital space so vulnerable to fake news and social media communications, it’s impossible to take digital content at face value. Data analytic solutions take various approaches to the problem of reliability. Datamaran triangulates data across sources to gain objectivity. Yet, the platform does not take a position on the factual truth of the content it analyzes. Its focus is not on assessing actual sustainability performance, but whether or not a topic is addressed. If an issue receives attention in media and reports, or if a company is seen in a certain way, this perception in itself is valuable information that should be considered in sustainability strategy. RepRisk deals with the uncertain reliability of corporate reports by ignoring them altogether and instead focusing on data that come from external sources, such as media, stakeholders and third-party evaluators. Still, an automated analysis is only as good as the sources it processes. Fortunately, human experts can aid in evaluating the reliability of business intelligence. After RepRisk’s system performs an initial computerized screening, it delivers the results to analysts, who complete the process, safeguarding data integrity and analysis quality. As companies seek new ways to integrate sustainability into their strategy and business models, data-driven solutions are evolving to meet those needs. Ioannis Ioannou, professor at London Business School, believes that new data technologies will come to assume a central role in sustainability strategy.